That's Sir Knight Robert Coleman, Jr. and I hamming it up at Thursday night's organizational meeting at Raper Commandery for a new Knights Templar re-enectment unit. Bamboozled Brethren Bowing Down To Ba'al??!! Therefore, all Masons are unknowingly praying to Ba'al when they say "The Grand Architect of the Universe." Just like we were all unknowingly worshipping Satan when we bought a box of Procter and Gamble soap powder, because "everybody knows" that the old P&G logo of a moon and stars was a Satanic symbol (and had nothing to do with the fact that the company started out in the 1800s by making candles, and created a pretty logo alluding to nighttime). What's surprising at first glance is that the show includes footage willingly provided by Capstone productions showing the reenactment of the Capitol cornerstone ceremony, as well as onscreen interviews with Brothers Brent Morris from the AASR-SJ and Trevor McKeown the Grand Historian from the Grand Lodge of British Columbia and Yukon. The brethren do an outstanding job of calmly answering the stooopid questions posed. But the power of editing is used to juxtapose then with the deranged allegations of fundamentalist Christians with an anti-Masonic agenda, and with anti-Mason, anti-Mormon Ed "There's A Goat Of Mendes In The Streets Of Washington" Decker. Doubtless, this hit piece will help Ed sell a few more of his preposterous books. As Freemasonry comes to greater public attention now and in the coming years, more of this pap will be trotted out. When our more intelligent spokesmen appear in these kinds of shows, the problem they all face is how their remarks will get sliced into little chunks and used as fodder for the anti-masons. There's no way to know the agenda of a producer who calls looking for someone to interview, and I promise, no one gets to see the narration script ahead of time. So, bravo to Brothers Morris and McKeown for being voices of calm in a program of hysteria. Should you feel compelled to view this nonsense, see it here. Other names for Ba'al include Moloch and Hadad, God of rain, thunder and agriculture (which is where this whole "god of grain" thing comes from). Hmmm. Hadad looks not far off from Hodad and not a far stretch from... Hodapp. Bow down before me, oh witless cravens! Britain's Internet Lodge No. 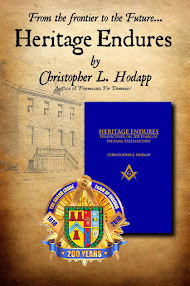 9659 has announced a call for Masonic papers. The Short Papers Competition 2007 is designed to encourage the writing of brief works that can be used as Masonic education in the lodge, restricted to just 500 words - about a 5 minute speech. There are several categories of awards, so read the rules and all links carefully. Closing date is December 31st, 2007. 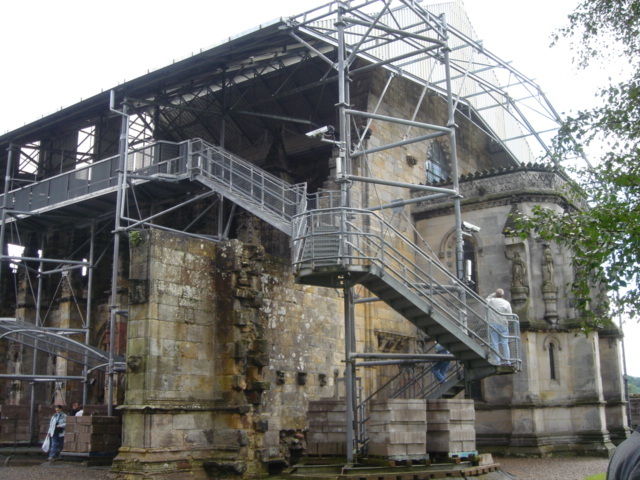 After 10 years under its tin roof lean-to, it looks like Rosslyn Chapel is getting a major infusion of grant money to at last get started on restoration of its interior carvings. The Scottish Lottery and the Historic Scotland fund will be providing £7 million to the chapel. Have a look at the 360 panorama views of the chapel interior. The biggest problem at the chapel has been a misguided restoration attempt in the 1950s that actually sealed water inside of the stone and caused more problems than it solved. For 10 years, there has been a roof erected over the tiny building to allow it to dry out. Now restoration can get under way. This is big news for Freemasons, Knight Templar and Da Vinci Code fans who all have their own interests in the chapel. More articles here and here. I'm headed for Scotland in May, and it will be my first time visiting the chapel. As a member of the Rosslyn Chapel Trust, I couldn't be happier about this news. I encourage anyone with an interest in supporting the chapel consider joining the trust to do your part in helping to preserve its unique heritage. A major investigation into financial improprieties within the Shrine was splashed across the New York Times this morning. • A top Shrine official told a meeting of temple treasurers that poor accounting for cash coming into the organization was “an increasingly common problem,” and that more than 30 temples had discovered fraud — like theft of money and inventory, altered bank statements, padded payrolls and fake invoices — amounting to as much as $300,000 and involving members of their “divans,” the five-member boards that govern each temple. • In Texas alone, at least four of the state’s 13 temples have lost money to theft, embezzlement and faulty accounting over the last five years, according to several Shriners there. • In one of the rare cases where the Shrine prosecuted wrongdoing, the Zem Zem temple in Erie, Pa., accused a former top official last year of misappropriating $1.2 million in bingo revenues. The temple settled for an undisclosed amount. “The leaders of this organization think it is better to persecute the innocent than to prosecute the guilty,” said Clairence Ballard, a member of Cahaba Shriners in Huntsville, Ala., who found that charitable money raised through bingo was being used to cover fraternal, and perhaps personal, expenses and faced an internal inquiry. [Richard A. Baumback] became potentate in 2003 and immediately received a personal reminder of flaws in the temple’s financial controls: The $10,000 he had raised the year before to offset expenses he expected as potentate was gone, tapped by his predecessor to cover temple deficits. “He told me that was the way the system worked,” Mr. Baumbach said. "Freemasonry Builds Its Temples Among The Nations and In The Hearts of Men." 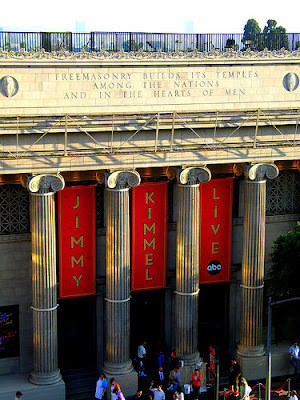 The audience for Jimmy Kimmel's show in LA pass under the message of Freemasonry every single night. How many look up to see it? I drove past it twice a week when I lived in LA for 5 solid years, and I never saw it. The last of the new manuscript has been sent off. Just leaves two weeks of manuscript review, but that should be simple. This is the first project Alice and I have collaborated on from start to finish, and I think we complement each others' style and strengths well. We'll know soon if anyone else agrees. Shortly before I started working on Solomon's Builders last year, I was attending a gathering of a club for younger men who were members of the fraternity. Almost everyone in the room was under thirty-five with the exception of myself and the father of one of the other men. The older man came over to me and we began to chat. He was in his late sixties or early seventies and spoke with a very thick accent. The gentleman, an emigre from Transylvania in Romania, had come to America in 1965. Romania in those days was a puppet state of the Soviet Union. Their king had been forced to abdicate by the Soviets in 1948, and the country had been bled dry economically to pay for Stalin’s postwar debts. Between 1948 and the mid-1960s, almost two million Romanians had been arbitrarily thrown into prison for political, economic or other unspecified reasons. The Communists had the blood of at least 200,000 Romanian people on their hands, along with hundreds of thousands of incidents of torture and abuse of Romanian citizens. It was against this backdrop that this gentleman had secretly fled from his homeland as a young man and come to the United States. Then he told me a curious thing. He had first read about the Freemasons in Leo Tolstoy’s War and Peace, and like Tolstoy’s Pierre, he wanted very much to become a Mason. 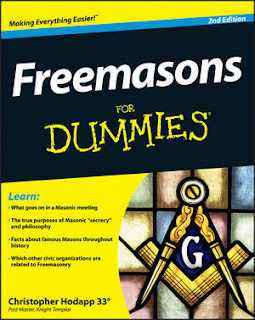 But Freemasonry was outlawed at that time in Romania, just as it had been outlawed all across the Soviet bloc, Hitler’s Germany, Mussolini’s Italy, Khomeini’s Iran and Hussein’s Iraq. When he came to America and became a citizen, he said, the first thing he did was to petition a Masonic lodge. Because it was a symbol of freedom to him. Because Freemasonry can only exist in a free country. The issues of liberty and equality are intertwined with the fraternity of Freemasonry as much today as they were in 1776. Men living under fascist regimes have been persecuted or even executed for the “crime” of Masonic membership. Yet, Freemasonry survives and grows wherever men are free. One need only look as far as the former Soviet republics where Communism has died to see the rebirth of their Masonic lodges. Even in Romania. The United States is a symbol of freedom the world over, but it’s easy to forget that fact when the news is filled with stories of bomb plots, protesters and pessimistic national self-loathing. The flip side of anti-American terrorism is the unmanageable mob of immigrants beating down our doors, because the United States is still the destination for a globe filled with people who lie awake nights dreaming of liberties that Americans don’t give a second thought, or sometimes even a first. At least not until a gentle man from, say, Romania wakes us up and reminds us. Had a terrific time at Indiana's Plymouth-Kilwinning Lodge #149 in the northern climes of Plymouth, Indiana last night. Many thanks to Most Worshipful Grand Master James Barkdull and the brethren of his home lodge for their generous hospitality. WM Rod Back and his lodge have much to be proud of, and they are definitely part of a growing group of lodges who have vision, enthusiasm and a proper understanding of the true tenets of Freemasonry. By the way, I covet your officer's chairs - truly one-of-a-kind masterpieces. Many thanks also to my good friends Wbros. Nathan Brindle and Jim Dillman for their friendship and their company on the long drive.